The expectation of Christmas is a promise of a new life; a new birth. Christmas is a season where the message of Jesus on peace and reconciliation reverberates throughout the world. People around the world celebrate Christmas to mark the arrival of Jesus, to enlighten the masses who were in darkness and light up the world with new hopes and aspirations for a joyful future. This incredible night, in which the miraculous star in the Eastern horizon, seen by the prophets, stood stationary in the sky above the shepherd’s hut in which the child Jesus was born to this world: that was the night the messenger of the eternal message of unreserved love was born. Jesus uttered words filled with love and kindness throughout his life. He spoke to ordinary people, such as fishermen, carpenters and farmers. “You have been taught to seek eye for an eye for revenge, or hit out with a boulder in revenge if you are hit with a stone. Yet I ask thee to show mercy to the enemy, to spread love for those who hate you or make you suffer with torture,” Jesus urged. Christmas is a season which brings forth the wholesome goodness of a great visionary. It is the time to fulfil his aspirations. Christmas helps those who strive to enter into the gates of sheer damnation to look back at that narrow entrance to a new meaningful life. Jesus preached to the world full of evil persons, attempting to fool others by cunning and shrewd methods, that one will not be able to enter Heaven unless they become innocent like children. May those verses, preached for the sake of humanity, filled with kindness for the betterment of the world, be spread throughout the villages and cities in this Christmas season! May the values of great humanity, reconciliation, and generosity preached by Jesus spread around the world this Christmas! 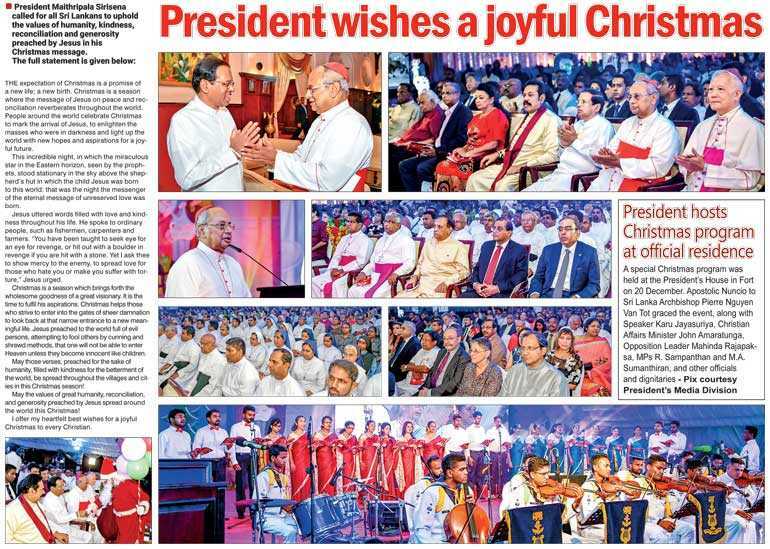 I offer my heartfelt best wishes for a joyful Christmas to every Christian.